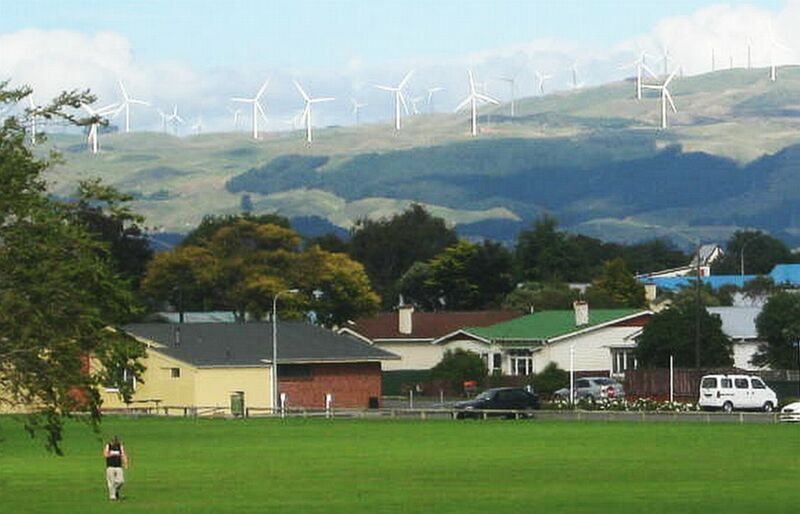 These wind electricity generating turbines overlook this township. I never took a note of where it was but it is somewhere in the southern North Island not too far from Wellington. Perhaps Fielding? This looks like it was taken in Palmerston North looking across Coronation Park to Tremaine Avenue. What a beautiful photograph! The colors are so vivid. I know you're not responsible for the colors, but 'Good Eye!" anyway, yeah? Something that--for me--adds to its beauty is the presence of those energy windmills. It is almost poetic. Kind of like someone is saying, "This place is so beautiful. I want to strive to keep it beautiful for a bit longer!" anyway, after all those words, I guess I just wanted to say, this photo made me happy today for a bit!